The forthcoming Laser Interferometer Space Antenna (LISA) will be a huge instrument allowing astronomers to study phenomena including black holes colliding and gravitational waves moving through space-time. Researchers from the University of Zurich have now found that LISA could also shed light on the elusive dark matter particle. Scientists from the Center for Theoretical Astrophysics and Cosmology of the University of Zurich, together with colleagues from Greece and Canada, have now found that LISA will not only be able to measure these previously unstudied waves, but could also help to unveil secrets about dark matter. Dark matter particles are thought to account for approximately 85 percent of the matter in the universe. However, they are still only hypothetical—the name refers to their elusiveness. But calculations show that many galaxies would be torn apart instead of rotating if they weren't held together by a large amount of dark matter. That is especially true for dwarf galaxies. While such galaxies are small and faint, they are also the most abundant in the universe. What makes them particularly interesting for astrophysicists is that their structures are dominated by dark matter, making them natural laboratories for studying this elusive form of matter. In a new study reported in Astrophysical Journal Letters, UZH Ph.D. student Tomas Ramfal conducted high-resolution computer simulations of the birth of dwarf galaxies, yielding surprising results. Calculating the interplay of dark matter, stars and the central black holes of these galaxies, the team of scientists from Zurich discovered a strong link between the merger rates of these black holes and the amount of dark matter at the center of dwarf galaxies. Measuring gravitational waves emitted by merging black holes can thus provide hints about the properties of the hypothetical dark matter particle. The newly found connection between black holes and dark matter can now be described in a mathematical and exact way for the first time. Lucio Mayer, the group leader, says, "Dark matter is the distinguishing quality of dwarf galaxies. We had therefore long suspected that this should also have a clear effect on cosmological properties." The connection comes at an opportune moment, as preparations for the final design of LISA are under way. Preliminary results of the researchers' simulations were met with excitement at meetings of the LISA consortium. The physics community sees the new use of gravitational wave observations as a promising new prospect for one the biggest future European space missions, which is expected to launch in about 15 years and could link cosmology and particle physics—the incredibly big and the unimaginably small. There is no such thing as "Dark Matter". If it is Matter, then its Quantum particles will emit/give off Energy as long as the particles are in motion - which causes that Matter to emit light of varying intensities. Another simulation: "Snapshots of the 120 million particle simulation"........they took pics of a simulation, probably hoping there'd be those who could be fooled into thinking such a silly fantasy actually exists. "Oh! What A Tangled Web We Weave When First We Practice To Deceive"
That could also apply to stump's posts. "In a new study reported in Astrophysical Journal Letters, UZH Ph.D. student Tomas Ramfal conducted high-resolution computer simulations of the birth of dwarf galaxies, yielding surprising results. Calculating the interplay of dark matter, stars and the central black holes of these galaxies, the team of scientists from Zurich discovered a strong link between the merger rates of these black holes and the amount of dark matter at the center of dwarf galaxies. 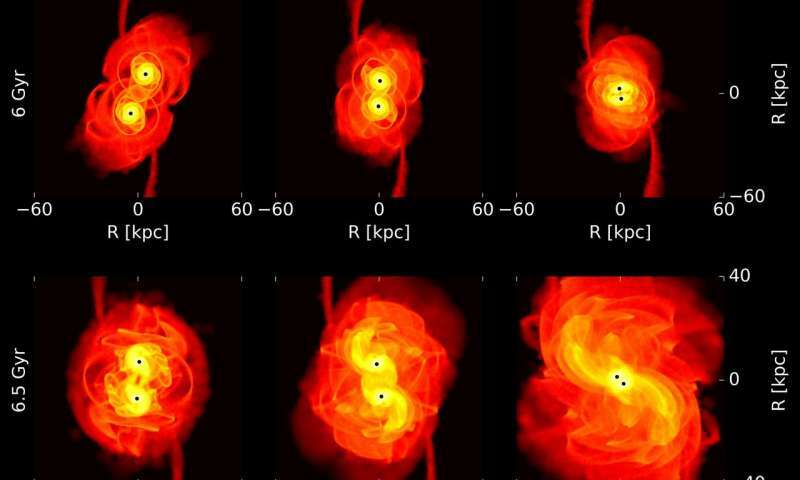 Measuring gravitational waves emitted by merging black holes can thus provide hints about the properties of the hypothetical dark matter particle." Dark matter is a supersolid that fills 'empty' space, strongly interacts with ordinary matter and is displaced by ordinary matter. Energy doesn't make spacetime curve away from it, as though it was displaced or needs to expand to accommodate the energy. The opposite occurs; the energy draws spacetime inwards, analogous to how magnetic field lines concentrate themselves through piece of iron. The adjacent surrounding spacetime is stretched inward per the equations of general relativity.